UT Shuttles & Capital Metro bike racks are designed to hold two standard bicycles with wheels 16" or larger. Electric bikes under 55 pounds can also use the racks. Stand up as the bus approaches and remove any items that might fall off your bike, like water bottles or child carrier seats. Make eye contact so the bus operator knows you'll be loading a bike. 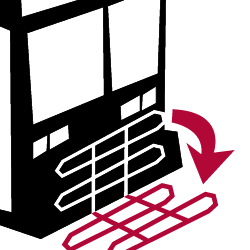 Racks are on the front of the bus - If the rack is full, please wait until the next bus comes along. Load your bike directly in front of the bus or from the curb - never from the street side! Pull the spring-loaded support arm out and over the front tire until it hugs the tire. The bus operator can't get off the bus to assist with loading (except on some Express buses), but can help with verbal instructions,if needed. As you approach your stop, let the bus operator know you'll be unloading a bike. Unload the bike directly in front of the bus or from the curb - never from the street side! After removing your bike, move towards the curb and signal the bus operator you're done. If you can't unload your bike before the bus pulls away, call CapMetro Customer Service at (512) 389-7454. Wait until all passengers have cleared the doorway before moving your bike in or out. The onboard location for bicycles is in the mobility-impaired/senior seating area. Hook your bike on the rack provided and take a seat -or stand holding your bike in the designated standing area. 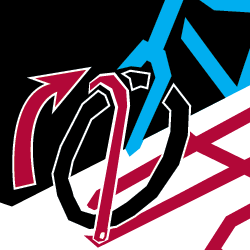 If a mobility-impaired or senior customer boards the train, cyclists must remove their bikes and move to a safe standing area, such as the end of the compartment. If you can't unload your bike before the train pulls away, call CapMetro Customer Service at (512) 389-7454. 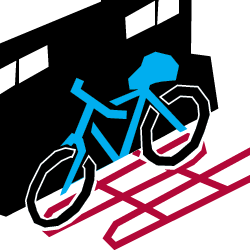 Passengers are responsible for loading and securing their own bicycles on buses and trains. Capital Metro is not responsible for personal injury, property damage or property loss arising from the use of the equipment. Please use at your own risk. Learn more about riding your bike on CapMetro.